Today I did an experiment with yarn since I knew it was possible to rug hook using yarn. I bought a small roll of burlap at one point at Michaels since it was on sale. That is what I used since it was hemmed and I could cut a piece of for a small piece. I have tons of yarn to play with, so I doodled a design and went at it. I should have used thicker yarn, but it worked well enough for a first try. The paisleys look okay, the flower and swirl at the bottom turned out good. The red blob in the middle was supposed to be a heart. I cannot figure out how to get it to keep its shape. I even tried to use black to outline it but it still turned into a circle. It kinda looks like a ladybug so it’s fine I guess. I do want to learn how to do a proper heart though! Sharp points are hard. There was supposed to be a star but I just could not get it to work out. The top right is a crescent moon with a random purple blob on the right, and another in the top center. It was a good learning experience. I do want to try again with thicker and better yarn. I just dug into my acrylic stash for trying this out. I am going to look around online to see what I can find for tutorials/classes. Over the weekend I finished knitting my first project that is not a basic scarf or plain rectangular shawl. I also used a pattern for the first time. Since I am still a beginner, I wanted something easy. I found the Wingspan shawl on Ravelry and thought to give it a try. I worked on it off and on for a week and finished it Sunday. It is a super easy pattern and one that people should try if you are just learning to knit. Experienced knitters could do it in their sleep! 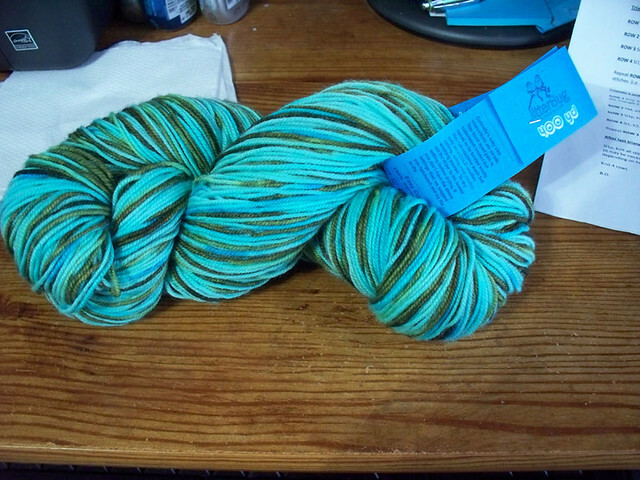 This is the yarn I used. It is Jitterbug in the Ischia colorway, 100% superwash Merino sock yarn, 400 yards at 150gs. The pattern called for 100gs but did not give yardage. I am glad I went with this yarn because I only have a tiny ball left. Keep that in mind if you want to make this yourself. And here is what it looks like. It is not a big shawl (more a shawlette), a lot of people would probably consider it a scarf. If you want to get the pattern (sorry, it’s not free), you can find it on Ravelry HERE. I have started learning how to purl and so far it is going good. I started doing it the wrong way at first because I didn’t know you were supposed to alternate when you switched sides, but after going to craft night at the Voo, that is fixed. I will post a picture later of what I have so far, though I’m not making anything specific at the moment. So after month of not having gone, last night I went to the Voo for craft night. There were lots of crafters there working on differnet things (knitting, making cards, making boxes and bookmakrs for some book thing). I got one of the knitters to show me how to do it the right way because I knew I was doing it wrong. So after a few tries I got the hang of it and now I know how to knit correctly! After I practing the knit stitch more, I will have someone show me how to do the purl stitch and then I can try out some of the projects I have been eying. I am still going to finish the cloak for my doll and then I’ll practice more and just make squares and stitch them together for a blanket. I have been teaching myself to knit and so started with something easy; a scarf! So far I have been doing pretty good at keeping it even. In the beginning I picked up a stitch but have since got it back down to where it should be and kept it like that. When it’s done, it’s going to my mother since she claimed it.